As a conference venues finding company, we have found the perfect venue for a multitude of events over the years, and so we are aware that one of the hardest parts about organising an event is actually getting people to attend. What you need, then, is a tried and tested marketing strategy that not only promotes your event effectively to your target audience, but that helps to drive ticket sales as well. You will not only need to use email marketing, social media marketing and word of mouth as part of your strategy, but you will need to use these tools in a way which is logical, and ensure that each promotion you undertake reinforces the last promotion you did, as well as making sure that the right message is delivered to the right person every time. 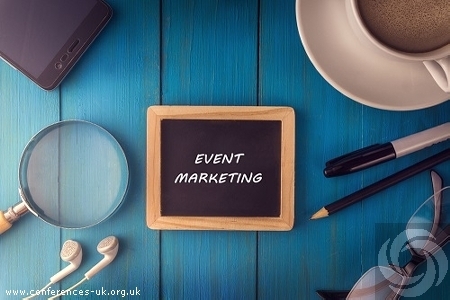 We've pulled together some of the most common event marketing tactics that have proved to be successful in the past - but obviously all events are different and so there may be added extras to this plan that we haven't included here. However, this is the basic event marketing timeline that should help you to plan your strategy for your next event: - Stage One: Pre-event The most important part of marketing your event happens before the event starts. You need to make sure that the right people know about your event and are driven to purchase tickets. There are a variety of ways in which you can do this: - Event landing page - Create an event landing page as soon as you have the date of your event set - you don't need to wait until you have all of the final details in place before you set the page live. Having an event page early on gives you somewhere to drive invitees to in order to capture their interest, and this will also help you build up your SEO authority with Google. You can also use it for big announcements, such as location and speakers, which will again help to drive up interest as well. - Blog post - in tandem with your landing page, you should also release a blog post which will contain your mission statement behind the event and why you are organising it. You can then use this post, with the landing page, to drive the rest of your pre-event marketing and help to convince people that they need to attend your event. If you are using one of the many interesting conference venues London then you can include some information about that in your post to tempt people to attend. - Use social media - the earlier you can promote your event on social media, the better, as you will then create great momentum leading up to the event and build up a good community as well. You should also come up with a hashtag that is unique to your event, and not being used by anyone else. Don't just concentrate on the biggest platforms, such as Facebook, Twitter and LinkedIn but also think about Instagram, Snapchat, Pinterest, and YouTube. Stage Two: Event Launch Getting your event launch right is the second most important stage of event marketing, so you need to think about: - Email - a lot of event organisers will tell you that email is one of the most effective ways to increase ticket sales, and so as soon as your event is ready to launch you should send out your first email blast to potential attendees. - Press Release - Although it is highly unlikely that your event will be picked up by the national press, press releases are still worth doing as you may get some local press, trade press or even niche press. The best way to achieve coverage is to focus on two benefits - why your event is different to all of the others, and someone involved in the event who has an interesting story. - Blog and Social - In a similar way to Pre-launch, writing a blog post at this stage will give you more content to share on social Stage Three: Lead Up to the Event This is the hardest stage of all as you need to keep building excitement in the lead up to the event: - Email, social and blogging - You need to constantly create content in the run up to your event launching but they can't all be sales messages as this will quickly turn attendees off. You should try and create a mix of high value, interesting content to keep your attendees involved in the event and excited about attending. You can then use this email and blog content to fuel your social media posts. - Guest Posts - Blogging on your own website is important for SEO, but being featured on other high authority sites will help you to find a new audience for your event. The type of content you create will depend on your industry, but white papers and industry reports tend to go down well. - Offer an Early Bird Discount: Once you have got past the original launch phase you need to come up with ways to keep people interested and booking tickets, and one of the easiest ways to do this is by offering an early bird discount. - Paid promotion - This point in the marketing schedule is the best time to invest in paid promotion as if you do It any earlier, you haven't really got anything to sell! Stage Four: Last Call - Email, social and blog - last push with direct call to actions to convert readers into ticket sales - Attendee referrals - quite often a missed opportunity, instead of focusing on new audiences why not reach out to the people who have already booked and ask them to promote the event on your behalf? You can always offer them some kind of incentive if that would help. If you break down your event marketing strategy into these four stages then you should be in a much stronger position to build momentum and sell more tickets for your event. If there is anything we can help with when it comes to your event, such as finding you the most amazing conference venues in London, then please don't hesitate to contact us today. You can call us FREE on 0800 078 9585.